It’s crazy to think that a new year is right around the corner but it’s coming! The countdown is on as we wrap up this year and look to all of the great things that are coming! Have young kids like we do? New Year’s Eve doesn’t have to be an adults only affair! Try these fun activities and learn how to have a kid friendly new years eve without having to stress out about it! Make some fun Countdown Marshmallow Pops to enjoy as midnight approaches. Conduct a family interview at the beginning of each year and save them in a scrapbook! Help your little one make the numbers for the new year with this celebration play dough. Make your own confetti to throw at midnight or to create a fun collage. Make sparkly confetti slime to occupy little hands during the festivities. Write down your wishes for the new year, and put them in these fun New Year’s wish crackers. Make your very own countdown clock to count down the hours until midnight. Find out what’s in your future this year… Paint and eat some fortune cookies. Use confetti paint to paint festive numbers for the new year. Fill a time capsule with family photos and goals to open on New Year’s Day the next year. How fun! It just isn’t a New Year’s Eve party without lots of noisemakers. You can make these out of your leftover Christmas wrapping paper! Fill surprise balls with trinkets and treats for your kiddos to enjoy. Create your own confetti poppers instead of buying them from the store. Make some styrofoam cup fireworks if heading out to see them live is not an option. Of course, you have to have some diy party hats. Party slime is a great way to play with confetti without all the mess. Well, without too much of a mess, anyway. Make a number headband with pipe cleaners! Sport sparkly fireworks rings for the day. Get noisy with these easy peasy paper plate noisemakers. 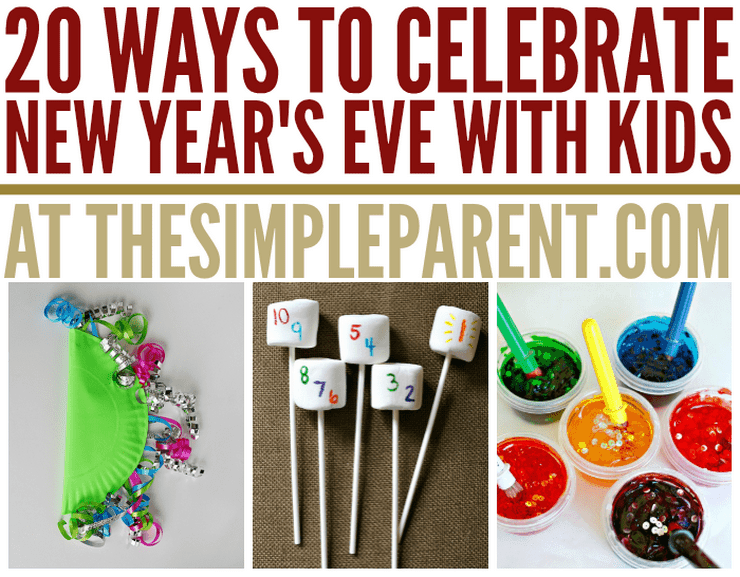 For even more ideas, check out 20 Ways to Celebrate New Years Eve with Kids and 52 New Year’s Eve Activities for Kids!